The NBA is the only All-Star weekend of the big four North American sports that I watch. The celebrity game is fun, the rising stars game generally steals the show, and the Saturday Night skills competitions are consistent an fun. Even the actual All-Star game on Sunday is generally an entertaining game with the competitive nature of the athletes taking over late in the game. The other great thing about all of these All-Star events is that you can bet on each one. Whether you want to bet on the Rising Stars MVP, Steph Curry to win the 3-Point Contest or Luka Doncic to win the Skills Challenge, you can place your All-Star bets online. On this page I will recommend our top rated betting site for NBA All-Star weekend, look at some of the odds, and provide a simple 3 step guide you can follow to place your All-Star wagers. SportsBetting.ag is our top rated betting site for Americans looking to bet on NBA All-Star 2019. SportsBetting has been a major player in the United States sports betting market over the past 15 years, and has built a strong reputation as a trusted and fair sportsbook. They accept players from everywhere in the USA (no state restrictions) and have plenty of All-Star bets to choose from. Let’s look at a few of the bets you can make on NBA All-Star 2019. You can find the odds on the SportsBetting.ag website by opening the ‘Futures’ drop down menu and selecting ‘NBA All-Star’. There will be more betting options available under the ‘NBA’ drop down menu on the weekend. 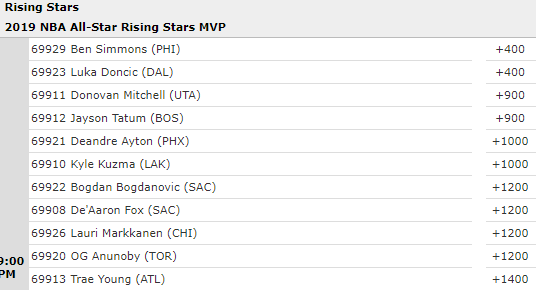 These are the 11 guys with 14/1 or better odds to win the MVP. You can see the full list of odds at the SportsBetting website. I personally like Trae Young at 14/1. I think he’s the type of guy who could thrive in a game like this, and he won’t hesitate to jack up plenty of shots. The last three years it’s been big men that have won the Skills Challenge with Spencer Dinwiddle, Kristaps Porzingis and Karl-Anthony Towns getting the W’s in the past 3 years. Before that it was mostly skilled guards getting the wins, so the question is whether or not you think the big-man trend will continue. I think there’s a lot of luck that plays into this competition, so I would just take one of the longer odds guys like Kuzma or Vucevic to get a horse in the race and then sit back and enjoy. First off, I would not take Curry at 2/1. He won the event in 2015, but he’s also 1-4 all-time. This competition simply comes down to who gets hot, and I think the longer odds guys have just as good a chance as Steph. Booker is the defending champion, while also holding the record for most points in a round with 28/34 in last years finals, so I think he has much better value at +450 than Steph at +200. Dirk at 12/1 is interesting. He’s won the competition before and it would be a nice story for him to get the W. Seth Curry at 5/1 is another interesting play. Follow these three steps to get your bets placed on NBA All-Star 2019 online. Click the link above and fill out the short form to open your account. SportsBetting is our #1 rated sportsbook for Americans. See our full review here. Log into your new account and click on ‘Cashier’. Choose one of the deposit options (Visa, MasterCard, Neteller, Skrill, bitcoin, etc) and follow the instructions to fund your account. Use promo code SB1000 when making your deposit to opt-in to the 50% matching bonus up to $1000. Now’s the fun part. Placing your wagers! Click on ‘Sports’ from the top navigation bar and open the ‘Futures’ drop down menu. Select ‘NBA All-Star’ to bring up all of the All-Star Game weekend bets. Select the wager(s) you want to make, click ‘Straight Bet’ under the Bet Slip in the right sidebar, enter your wager amounts and click ‘Place my bet’. You will also be able to find the odds under the ‘Basketball’ drop down menu on All-Star weekend. If you’re new to betting check out our guide section for a few beginner articles. Ready to bet? Click here to visit SportsBetting.ag.